If you’ve decided to get married in Sunirver, you’re in good company; it is one of the most popular wedding venues in Oregon. The music that accompanies your big day should be something that is both classy with a dash of rustic chic. Musicians that can play both classical and Americana/Folk would be perfect for this venue, and my band the Ashlings is a great example of a group that can perform Sunriver Wedding music that fits the setting. For a Sunriver Wedding we played in February of 2013, the groom Matt Gorman requested this Bruno Mars song as the processional and it was a surprise for his wife. The chorus on this song is particularly powerful “When I see your face, there’s not a thing that I would change, ’cause you’re amazing just the way you are.” A great sentiment for a wedding and more of a modern and personal choice for couples looking to change it up a bit. This was a first dance choice for a mother and son song during a Sunriver wedding in the winter. The Great Room is absolutely enchanting in the winter, decorated with thousands a little tea lights and candles and a cozy fire burning at the centerpiece of the room. This song brought everyone back in time. This was the recessional for a Sunriver Wedding in the summer of 2012. The couple was from Hawaii and loved the version by Isreal Kamakawiwo’ole with Somewhere Over the Rainbow at the beginning. This is just one of those “perfect” songs. Again this was Sunriver Wedding in the winter, so the candles and the lights inside the cozy lodge reminded us all of the video. A lot of bridge request this song and it has really grown on me. While it may be more of a “pop” choice that everyone will recognize, there is a reason it is such a famous song. I always get it stuck in my head after we play it. One of the trendiest catch phrases country-style marriages today is “rustic chic weddings,” and it frankly has a lot of people scratching their heads. I thought it would be worth exploring, especially because here in Central Oregon, so many weddings fall under that category and there are an incredible plethora of venues that would be perfect for a couple looking to plan their own ceremony with a splash of rustic chic. I think the best way to describe a rustic chic wedding is one that has an element of the outdoors woven throughout, whether this is birch branch candle holders or twig incased signs labeling the dinner options. Textures are natural and organic, sweet and homey. There is homage paid to the days of yore when suspenders and cowboy boots and mason jars were just a way of life. The brides and bridesmaid’s dresses are often antique or vintage and the grooms and groomsmen also add a bit of country-whimsy to their style. In the summer of 2014, I played the wedding of one of my best friend’s from high school, Annie Dubois in Bozeman, MT at the Big Yellow Barn. This wedding was quintessential rustic chic: big mountains in the distance, wildflowers everywhere, a big old barn with all kinds of noks and crannies… The catering was also done country southern style on the rehearsal dinner night and everyone raved about how it was better than the day of. The songs they picked were also perfect in this setting: “Wildflowers” by Tom Petty, “Annie’s Song” by John Denver (You Fill Up My Senses), and finally “Tennessee Waltz” for the groom and mother’s first dance. If you are looking to plan your wedding with a rustic chic theme here in Oregon, the Central part of the state is where you want to come. 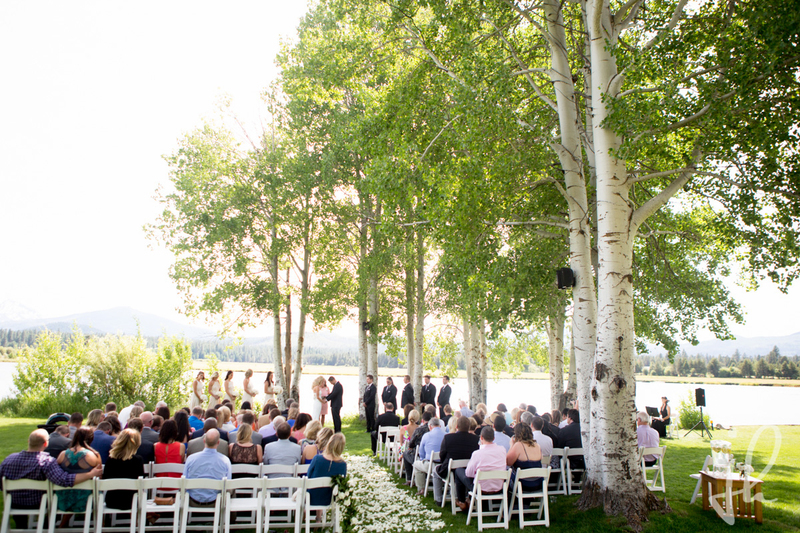 The venues in Bend, Sunriver and Sisters mix country charm with class and elegance like no other place in the Oregon. Some other advantages include a very good chance the sun will be shining, and lots of photo opportunities with majestic mountain backdrops of the Three Sisters, Mt. Bachelor, Mt. Jefferson and Three Fingered Jack. 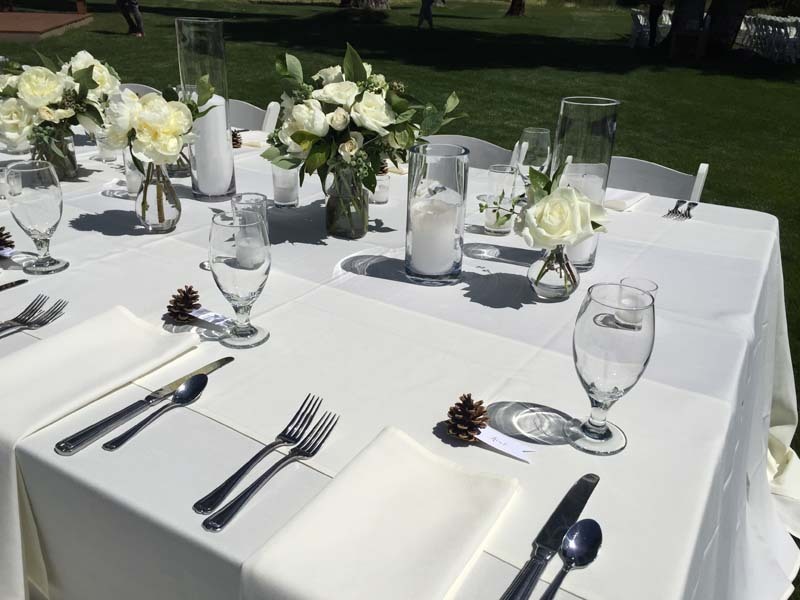 With the exception of a few indoor venues and churches, really all venues in Central Oregon could be considered rustic chic, but here are my top five from my own experiences playing weddings here in Bend and surrounding towns. The only venue that blatantly markets themselves as “rustic chic” in their copywriting, you can be assured this theme will define your wedding with almost no effort at all. Sweeping views of the Cascade Mountains are almost blindingly gorgeous at sunset. The employees that work there seems infused with some kind of higher cause that they are serving, and their pride in their work comes through in every interaction. This kind of experience is going to cost you, but if you want to go big, a wedding at Brasada Ranch is as good as it gets. 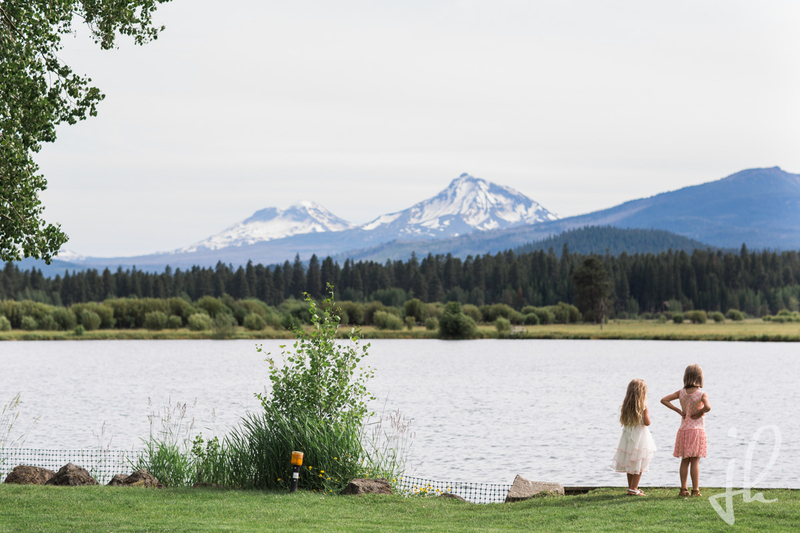 One of the most popular destinations for weddings in all of Oregon, Sunriver has endless accommodations for you and your guests and recreational opportunities are literally right out the front door. The Great Room where wedding parties often choose to have dinner, is the definition of rustic chic: exposed beams of gigantic old growth Oregon trees, magnificent fireplaces, room for 300… what more could you ask for? 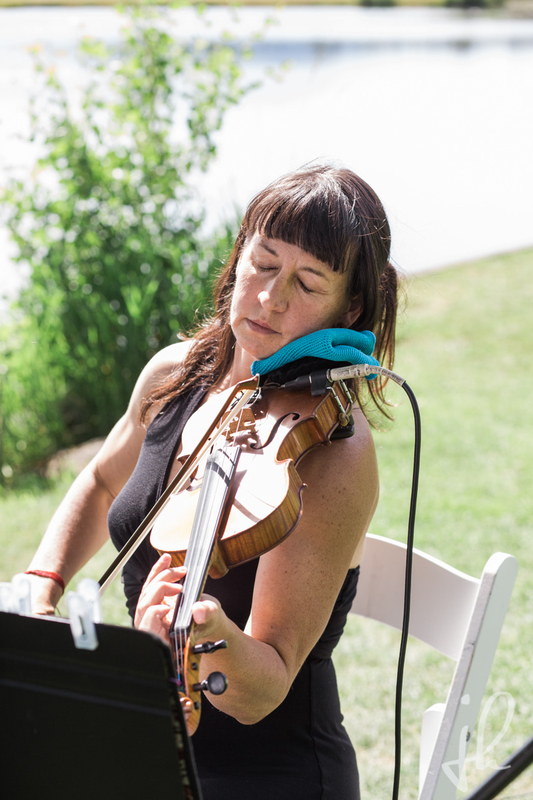 During one particularly elaborate wedding we played at Black Butte Ranch there were actually what appeared to be wild horses running through the meadows in the distance during the recessional. I never did find out if this was a set up, that might give you some idea of what kind of magic lies ahead at Black Butte. Yes, the accommodations may be a bit 80s, but there is a feel to this place that the generations of repeat guests bring to it summer after summer, which makes it feel like an American Classic… like you just stepped onto the set of Dirty Dancing… but in Oregon. The newest addition to Oregon’s list of rustic chic wedding venues, Tetherow combines world-class golf with ranch-style elegance. It needs to get guenunily roughed up a bit to shed it’s “theme park” like rustic-ness, but this top end venue just minutes from downtown Bend is sure to rise to prominence and it can accommodate many of your guests on location. And if golfing is your family’s sport of choice, the David McLay Kidd course is quite possibly one of the best in Oregon. A rustic check wedding venue for the rest of us. This cozy event hall lies at the northern tip of one of Bend’s most beautiful forest trail systems, Shevlin Park. If you have an active group of guests, this five mile loop could be a fun pre-ceremony walk lasting about and hour and forty-five minutes and showcasing some of the most intimate views of Tumalo Creek in Bend. The inside of the hall it self has a wood burning fireplace, but other than that is nothing to write home about. Aspen Hall’s magic is all about the natural beauty that surrounds, from the cute fishing pond off the back deck, to birch trees that line the walkways and paths around the property. At a little over for $1K a day, this is a by far the best bang for the buck in Central Oregon. Not everyone wants straightforward, classic love songs for their wedding. My favorite part about this list of indie wedding songs is that many of them have some kind of dark undercurrent or interesting sentiment that gets you thinking. I guess for me love is not straitforward, and a lot of these songs are willing to address that in different ways. We’ve had this song requested more than once for both the pre-ceremony music and the processional, and at first I found it strange that couples would want a song that seemed to be more about dying than living. But the enduring theme is loving someone so much that you can imagine being together in the afterlife. It’s also a great anthem to atheism and I know the composer Ben Gibbard is a recovering Catholic and there are lots of references in the second verse to the hypocrisies of the Catholic Church. Overall, I think this is a classic folk song that will be around longer than Death Cab. A great one to add for the playlists during the reception. Catchy and full of sunshine. Another song about death shrouded in a tale of a lifetime of love. “Eyes wide open, naked as we came, one will spread our, ashes ’round the yard.” I like this one for mid-ceremony. Somehow it is comforting to know that even though Glen Hansard and Marketa Irglova broke up at the end of this movie, they were together in real life. There is a lot of sadness in this song, but it is overpowered by hope and redemption, especially during the choruses when the power of their two voices together mix in harmony. I’d love to hear an instrumental version of this for the processional. There are hundreds, even thousands of classical pieces written specifically for the violin that would help make your wedding a more memorable occasion. Here are the top five most requested classical violin wedding music pieces we receive as our wedding duo or trio The Ashlings, and these are all songs that are part of our standard repertoire. We can perform these on violin, cello or an arrangement of both. By far the world’s most popular wedding song for the processional, Pachelbel’s Canon never gets old. It brings out emotion in me no matter how many times we play it. This song was buried for centuries and then rediscovered in the 20th Century and first published in 1919. But it’s placement in a number of pop songs of the 90’s include Green Day’s Basket Case and the Pet Shop Boy’s cover of “Go West” is what really catapulted this song into the American consciousness. Also known as the Prince of Denmark’s March, it was written by Jeremiah Clarke around 1700. It’s perfect for the procession or recessional after the couple has been presented to the guests. Great bit of trivia: it was the song played at the 1918 wedding of Charles, the Prince of Wales and Lady Diana Spencer. We do a wonderful version of this with violin or cello and guitar, but the link I included is to a version played with trumpets, how it was intended. Written by Felix Mendelssohn in 1842, this song feels the most cliche of all the typical wedding classical pieces, but it’s charm definitely lies in its history and tradition. Mendelssohn wrote this for a suite of pieces to Shakespeare’s play “A Midsummer Night’s Dream,” but this song was again popularized by the royals, namely Princess Victoria when she married Prince Rederick William of Prussion in 1858. I like this song as the entrance music for the bridesmaids and the groomsmen, but it really fits well anywhere in the beginning of the wedding or as background music while guests are gathering or leaving. One of Bach’s most famous works, it was written during his first year in Leipzig, Germany and is one of about two hundred cantatas he wrote for the Leipzig Church during that time, though this remains one of his most enduring works to date. This is the Franz Schubert version and it is one of his most popular pieces. It has an interesting history: originally composed as a setting of a song from Walter Scott’s poem The Lady of the Lake, the story is of Ellen Douglas who sings a prayer to the Virgin Mary, calling on her for help as a battle rages on in the distance of the Scottish Highlands. I fell in love with Jack Johnson’s music in college at Lewis & Clark in Portland. At the time it seemed like there was just nothing else out there like he was doing. His music sounded like surfing in Hawaii… sitting around a campfire after a long day out on the water. I fell out of love with his music for a time as I often do when artists go on to be hugely popular and I can no longer pretend they are my little secret. But now I’ve come to my senses, and I’m into it again. I’ve been really inspired by his songs lately and even wrote a bunch of my own, borrowing chord progressions and rhythms from some of his albums. Below are my handpicked top five Jack Johnson wedding songs for your ceremony or reception. I recorded a cover of Jack Johnson’s “Constellations” with my friend Franchot Tone on the guitar. I’ve spent so much time over the past year exploring different coast lines either kayaking or sailing that this song resonated in a lot of ways. He manages to capture something both beautiful and wholesome and mysterious all in one song. You can see yourself there on the beach watching the kids play in the surf, or later in the song sitting under a tree and waiting out the rain. It’s so specific to time and place and yet universal. Nice work. What a perfect song for the first dance of the bride and groom. This album was first released on his album “Sleep Through the Static” in 2008 and recorded at the Solar Powered Plastic Plant in LA (making it his first album not recorded in Hawaii.) Jack Johnson’s performance of “Angel” is perfecto, but something about this version of Angel by Jess Delgado seems to do the song a new kind of justice. I can only come to the conclusion as evidenced by this song and many others that the man is definitely in love with his wife. Again the word wholesome comes to mind. I’d recommend this as a casual recessional for a small ceremony or a first dance. This is a cool video of Jack having fun in Hawaii. I image this song sung by a guitar strumming groom. Can’t you see that it’s been raining? Hopefully that gives you some ideas if you’re looking for a little Jack Johnson wedding music for your big day. 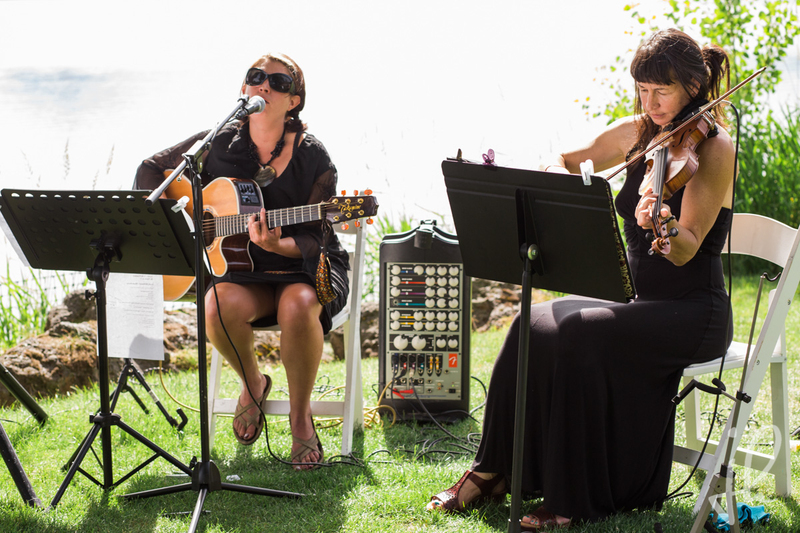 The Ashlings love to learn new songs, so pick your favorite and we’ll add it to our repertoire if you’d like us to play at your reception or ceremony.